Talk about a meaty find - this unknown species of flabby whalefish was recently hauled up by scientists trawling ocean depths east of New Zealand. More than a mile down, the team's nets found relatively few fish. 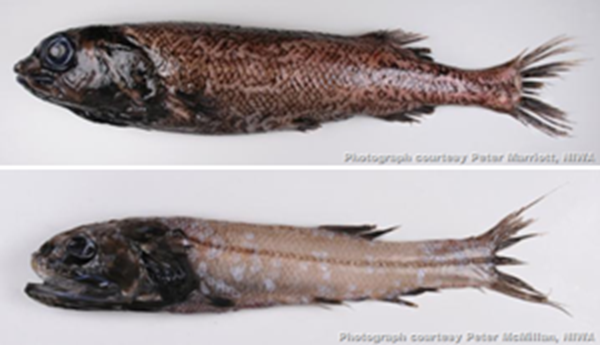 What they did find were several new species and some just plain "strange looking" ones, according to New Zealand's National Institute of Water and Atmospheric Research (NIWA). The rare flabby whalefish have tiny eyes and lack ribs. The 12.5-inch-long (32-centimetre-long) specimen above was caught 1.7 miles (2.3 kilometres) underwater - the deepest reaches NIWA's ever explored. Most scientific research and fishing has occurred above 0.7 mile (1.2 kilometres). NIWA had set up eight trawl stations to capture fish at varying depths around Chatham Rise, part of a network of underwater plateaus, mountains, ridges, canyons, and abyssal plains. "We know very little about the abundance and distribution of fishes at these depths," NIWA fisheries scientist Peter McMillan said in an email. The team discovered that the whalefish has little company below 1.3 miles (2.1 kilometres), where a small number of other fish, including skates, slickheads, rattails, and cusk-eels, were also found during the expedition. "The eight stations sampled a tiny area but gave us a useful snapshot of the animals occupying some of the seafloor at depths greater than 2,000 meters [1.2 miles] around New Zealand."